Many years ago, a researcher named William (Holly) Whyte started studying the flow of people in public spaces, leading to classic books on the subject, The Social Life of Small Urban Spaces (1980) and City: Rediscovering the Center (1988) one of my perennial favorites. His Street Life Project attracted research assistants including Fred Kent who went on to found Projects for Public Spaces (PPS), which does great work all over the world on public space community design and has an experienced staff working with great success with shed market or market district markets. Another early follower of Whyte’s work was Paco Underhill. In 1974 he attended what he calls a transformative lecture on Whyte at Columbia University. Inspired, Underhill conducted a street-mall study that he later showed to Fred Kent and Robert Cook, who were in the process of forming PPS. Underhill became one of their first staff members and then in 1979, founded his own consulting company, Envirosell which works with retail clients. Why should markets learn about retail anthropology? Shopper purchasing is changing, especially for place-based and especially for food purchases. Knowing your shoppers and what they want and how they search for it is at the core of market’s primary mission of building economic power for its vendors and community. More markets are searching for permanent or semi-permanent locations for their flagship markets and need to know how to choose the best from a retail standpoint and how to design it too. The pressures from chain stores eagerly co-opting the “local” and short-chain language of our movement means markets need to know how to analyze what is happening around them and how to respond. Lastly, as market vendors diversify into more outlets to sell their items, they will need market leaders who can assist them in selecting those outlets and even in negotiating or “curating” those other transactions as they do with the family table shopper at our markets now. Studying the work of these two companies is the easiest way into the retail anthropology sector as it is so closely aligned with Whyte’s “human-centered” framework. Observation and interview. Sounds a lot like how research is conducted at markets doesn’t it? Notice all of the data one can get from this one short video. Set up issues, weather, shopper density, egress issues (entering and exiting), the illustration of the 100% effect*, shopper activity at anchor vendor tables, the length of time in the market, and market break down among others. This is also helpful for those markets searching for a new location. If you can find a pole to tape an old iPod or iPhone far up and video the hours that the market would be set up there, think of what you might learn about the best way to design the space or even which direction to orient the market. This is the kind of sensible and appropriate data collection that we include and we keep adding to in Farmers Market Metrics, now available to all farmers markets members of Farmer Market Coalition for a small subscription fee to use all of its many features. So don’t think that every data collection process has to include a team of collectors and a bunch of paper. By using the technology you have in your hand, detailed and visual data is available for your leadership to make better decisions about the market right now. And methods designed by the experts in studying human movement in retail and public spaces available to you. Next post: Common layout choices for markets. As many of my readers know, I spent my early years in the west suburbs of Cleveland. Like many of us, I occasionally trucked over to the West Side Market to buy special items or to soak up the atmosphere-actually, maybe the right word is rarely. Luckily for me, I moved to the nearby Tremont neighborhood while a poor community organizer in the 1980s and 1990s and had more access to the market. My friends and I used the market quite regularly, as without it gas stations and a very dirty grocery store many dangerous blocks from us were our available shopping outlets. As we became regulars, many of the WSM vendors shared their end of day produce with us at a lower price or even threw in some items with our purchase. Later on, my nephew worked there while a teenager with a pal of my sister’s and since he had to be at work in the pre-dawn hours on the weekends moving meat up and down the stairs, now knows what hard work looks and feels like. So for those reasons I keep up on the news from this market so closely and why changes to it remain deeply personal to me. The changes that are being made, like paid parking and more days open, sound like they are to support the nearby businesses around the market more than those within the market- not that there is anything inherently wrong with that, just that it seems like the city is mostly responding to external pressures. I will say however, that for a public market to be closed on Sundays has always surprised me. I’d have preferred to see Mondays and Tuesdays as their dark days. Achieving balance between the needs of the neighborhood and of the vendors and shoppers is the most important task and, as any market organizer knows, is a delicate dance. Some of the comments in these articles from the vendors are implying a purely political reason for this change, others are willing to believe this is a good marketing idea in a constantly changing retail environment while still others are intractable in not changing the tradition of Sunday hours and even believe that it will only dilute Saturdays sales. (That may very well be a valid point that I will of course answer with they should be collecting data on their shoppers to know and be able to answer that question.) Shoppers’ opinions tend to line up on more days are better, which is certainly understandable. The parking woes that exist currently for shoppers are likely a large reason for people staying away and so more days open may solve that issue temporarily, but probably not permanently. I think what is missing in the announcements is the clear plan for this market and for these vendors by the management and advisors. Is the WSM becoming part of the cafe/entertainment culture that has grown up around it and therefore expected to primarily serve it? Or is the WSM part of the robust local food culture in Cleveland and meant to align itself with those values? Or do the operators see the WSM as an anchor for small business in and of itself? As a traditional shed market, a primary purpose must be defined and acted upon in their decision-making process because unlike pop up (open-air) markets, it cannot move and/or redefine itself easily. It must constantly draw people to its bulk through changing times and offer enough regular return to those permanent stall vendors who have also invested in shared infrastructure. How this change was handled in Cincinnati at the Findlay Market a few years back seemed unfortunate and led to a very public argument that meant the market had some bad vibes around it for a little while, but indications show that the changes there may have helped their growth. However, it is important to recognize that the entire area around Findlay is seeing increased vibrancy with millennials and urbanists repopulating OTR and downtown and so this success may have little to do with its added hours. I do think the management and supporters did some great work supporting that expansion. Certainly, there it is difficult or even impossible to achieve full agreement for almost any decision made by a market organization, but collecting data and using it to redefine the market’s mission and understand its context historically, now and for the future will help make the right decision clearer. And yes, I’ll shop on Sundays rather than Saturdays whenever I am back in Cleveland to leave my Saturdays for the direct marketing farmers markets around town. Great article linked below along with a salient excerpt about placemaking which is something all market organizations should know a little about. "Creative placemaking? What is it that you do?" | ArtPlace. Is your community working to become more livable and sustainable? Are you running into barriers in achieving these goals? Project for Public Spaces is excited to announce free technical assistance (through January 9, 2015) to address these challenges. Livability Solutions partners, which include the nation’s leading experts in creating sustainable communities, will lead one- and two-day targeted workshops in communities around the U.S. Communities will learn how to use PPS’ tools or workshop approaches, such as walkability audits, green infrastructure valuation guides, shared use agreements, and community image surveys, that can help achieve goals of enhancing livability, creating lasting economic and environmental improvements, and improving residents’ public and social health. A short report will be prepared for each community following the technical assistance. Eight to ten communities will be selected to receive technical assistance this year.Link to application and more information. 1. A public market is a public and recurring assembly of vendors marketing directly to consumers, engineered by a neutral regime. • are locally owned, independent businesses. 2. A farmers market operates multiple times per year and is organized for the purpose of facilitating personal connections that create mutual benefits for local farmers, shoppers and communities. To fulfill that objective farmers markets define the term local, regularly communicate that definition to the public, and implement rules/guidelines of operation that ensure that the farmers market consists principally of farms selling directly to the public products that the farms have produced. What is interesting to me about these two descriptions is that the public market definition may not encompass all farmers markets, since a “neutral regime” may not always be found, nor is the concept of public goals (transparency if you will) expressly outlined in the farmers market version. Conversely, the farmers market definition explicitly defines the “principal” role of farmers selling products produced from their farms while the public market definition does not stress product origin. Both assume that the market will define what local means, both mention direct sales and stress the concept of recurring. What would you add or change? Does one seem more appropriate to you? Is there a need for more markets definitions or for less? Do stakeholders within your region agree on the definition of a market? Is this where typology could be most helpful, especially within a region with many markets? I’d love to hear people’s opinions on these definitions and whether these seem accurate or relevant for their own regional definition. 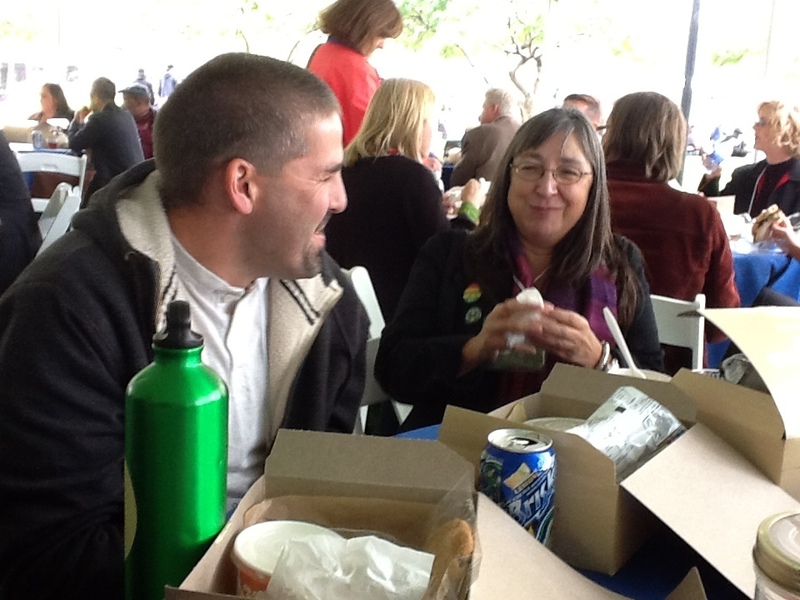 (below) Leslie from the Athens OH market community chats with Chris of the Burlington VT Farmers Market. Both of these markets have existed for decades, are over 80 vendors and are year round. Their markets definitely have plans and issues that the other can truly understand! 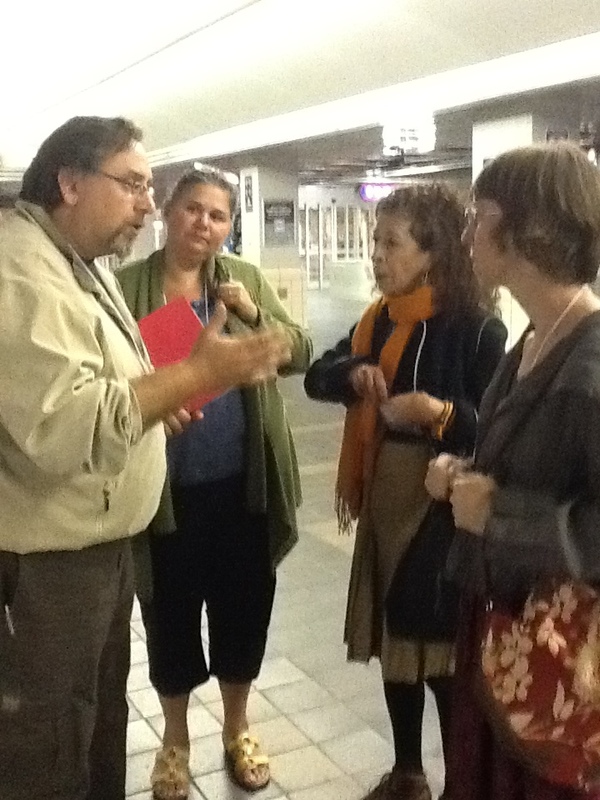 Toronto Food Policy Chair Helene St. Jacques and Greenbelt Farmers Market organizer Anne Freeman make friends with St. Lawrence Market vendors Odysseas and Sandra Gounalakis of Scheffler’s Deli and Cheese while they are all far from home and waiting on a “rapid” to the evening PPS conference event. Odysseas and Sandra paid their own way to the conference to learn about public markets so that they can be of assistance to the managers. Meeting the larger market community can lead to unexpected lessons, ideas and friendships. Take the time to take a “busman’s holiday”!